This statistic shows the results of a survey conducted in the United States in October 2018. 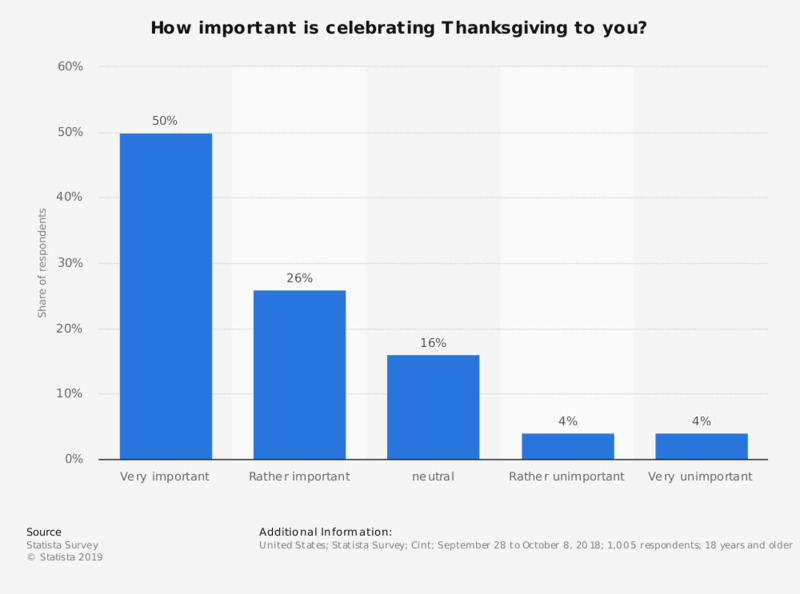 Americans were asked about the importance of celebrating Thanksgiving. During the survey, 50 percent of the respondents stated that celebrating Thanksgiving was very important to them. Everything On "Thanksgiving in the U.S." in One Document: Edited and Divided into Handy Chapters. Including Detailed References. Statistics on "Thanksgiving in the U.S."
What does Thanksgiving mean to you personally? What do you think is an appropriate price for a pound of fresh or frozen Thanksgiving turkey? At what time do you serve / take your Thanksgiving meal? How much money do you plan to spend on your Thanksgiving meal per person? Which of the following statements describe why you would shop in a store on Black Friday? How high does the expected discount need to be for you to hold off a purchase until Black Friday? What is your impression: Did the Black Friday offers get better or worse in the past 2-3 years? Are you using the Black Friday/Cyber Monday promotions to make a purchase on which you have held off? Canada: What do you personally find makes Christmas gatherings so special? Do you think St Patrick's day should or should not be a bank holiday?